Telltale traces of human blood, the final legacy of the single fatality of one of history's most spectacular aviation accidents, betray additional insight into the structural integrity and safety of Boeing's entire 737 fleet. 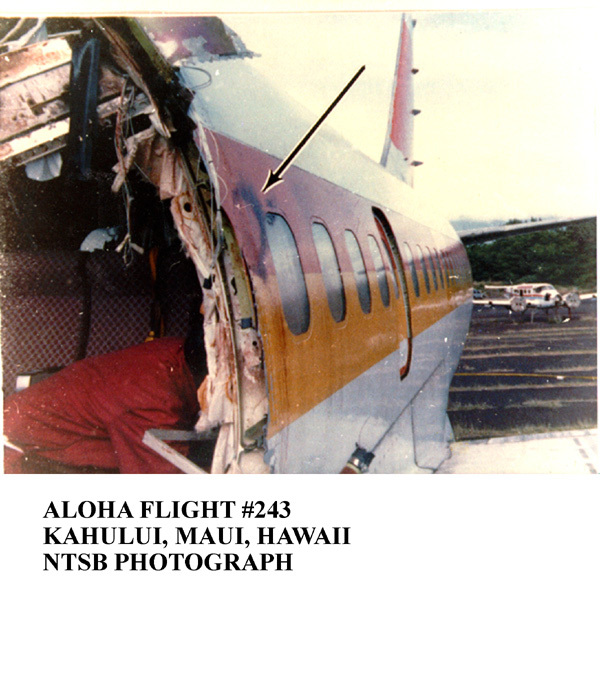 Clarabell Lansing, the senior flight attendant on Aloha Airlines Flight 243 that day, was, according to the Official NTSB conclusion, swept overboard at 24,000 feet altitude after a spontaneous failure of one of the aircraft's longitudinal joints. A photograph in the National Transportation Safety Board's docket of the accident investigation appears with the caption "Blood stain aft of separation on outside skin." In the entire 4,437 page document, there is no other reference to the why or how the blood stain appears on the outside of the fuselage. According to one senior NTSB investigator, only a few people recognized that the "blood stain" was actually a silhouette of Clarabell Lansing's skull. A large portion of the upper fuselage, torn away by the air stream during the accident, fell into the ocean between Hawaii and Maui and was not retrievable. The 737 was still able to land. 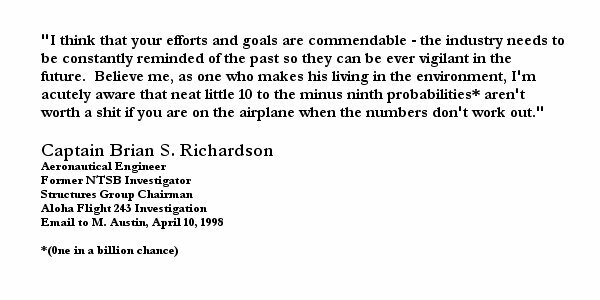 Under these circumstances, determining the exact failure scenario took a less important role in the NTSB investigation than the political opportunity to drive FAA enforcement and aviation industry awareness of the "Aging Aircraft problem" into the public arena. The importance of the "Skull Print Photo" is that it exists, and without official recognition of why it is there. If the "Halo of Blood" on the aircraft exterior is that of Clarabell Lansing, then the "best guess" of the initial cause of the failure on the Flight 243 accident is outright wrong. If the NTSB conclusions are wrong, then the correct fixes were not applied and a repeat of the Flight 243 accident is probably inevitable. Very disturbing is the thought that with so many pieces of the Flight 243 aircraft still intact, the greatest collective engineering minds in the latter part of the 20th century could misdiagnose the true accident cause. Even more disturbing is the revelation of Boeing's "fly-it-till-it-breaks" design philosophy for the 737 aircraft. The NTSB investigation was focused NOT on "Why did it break", but "Why didn't it break the way Boeing DESIGNED it to break?" The Ghost of Flight 243 haunts an industrial society consumed in technological arrogance. Ignoring the legacy of Clarabell Lansing is immoral and technologically just plain stupid. Designs that allow in flight failure are NOT acceptable for commercial jet airplanes that I fly aboard and the regulations approving these concepts should be modified. Honolulu Advertiser Story - "Studying what goes wrong is Austin's passion"